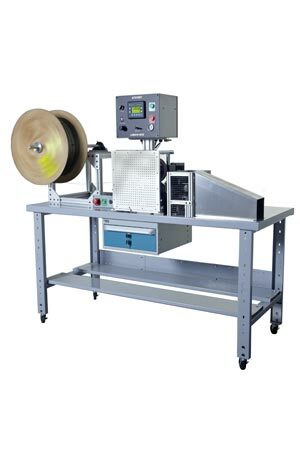 Pull Measure Cut System incorporates everything you need to automate the rewinding line. The system comes in scalable sizes and benefit users from small harness facilities to large cable manufacturers. A fully automated system incorporates payout system (dereeler), a Length Rite measurement device, an automated cutting system, and takeup system (coiler / spooler). The PMC system will save time, reduce space usage, and increase productivity. PLC technology is used to maximize cable counter function flexibility - we can include an HMI to make data entry easy. Jobs can be identified by a job number or the operator can simply input the length of cable required and the quantity of cut cables required and then press ‘Start’. Taymer is willing to customize our systems to suit your needs. According to your application, we will modify the set-up or system to make our equipment easy-to-use and work the way you wanted it to. We provide this great flexibility to minimize your time to search for the right products. The Length Rite Pull Measure includes a stepper motor to pull wire through the Length Rite. The Cut option may be included to allow automatic, pneumatic, hydraulic, or chop saw cutting of wire and cable with diameters up to one inch or 25mm. We work regularly with Allen Bradley, Siemens and GE PLCs and can include communications capabilities for corporate networks or standalone PCs through ethernet or serial communication ports. Taymer’s cable cut to length computer interface simplies the task of uploading and cataloging long lists of batch jobs. We are familiar with MS Access, MS SQL Server and MS Excel for inputting batch job data. Larger spools of wire and cable will require a motorized despooler to accurately pull & recoiling-through the Length Rite & Cutting Saw. Taymer’s Despoolers handle cable reels from 50lbs to 5500lbs. Smaller reels generally don’t require a despooler. Also included is a dancer or tension arm, minimizing the tension force required to pull the cable through the Pull-Measure-Cut. System will wait for operator to push go button before Payout of next length in the PLC cue, or next new length entered. A payout system is to unload the bulk wire or cable whether it is in the form of a spool or a coil. For heavy spools or coils, a motorized payout system might be necessary in order to prevent damage to the wire/ cable under high pulling tension. The wire / cable will go through a measurement device for accurate measurement. At this station, the operator or computer can assigned a target length so when the measurer reaches the length, a control system will stop the cable movement. This will lead to an automated cutter that cuts the wire. → If the wire does not need to be coiled or spooled, then a motorized puller is located before the cutter to pull from the payout. → If the wire needs to be spooled or coiled, a takeup system is required. The takeup system is motorized and will spool or coil accordingly. © 1962-2018 Taymer International. All Rights Reserved.